The 27th version of Chattogram International Trade Fair (CITF)-2019 will begin in the port city today with a view to creating opportunities for expansion of businesses of the small and medium entrepreneurs. Chittagong Chamber of Commerce and Industry (CCCI) is organising the fair at Railway Polo-ground like previous years. Commerce Minister Tipu Munshi will inaugurate the month-long fair as the chief guest at Bangabandhu Hall of World Trade Centre in the city at 3:00pm today. Deputy Minister for Education Mahibul Hasan Chowdhury and local Lawmaker and former President of the chamber MA Latif will also attend the inaugural ceremony as special guests. Over 450 participants from the both home and abroad would put their products on display at 22 premier gold pavilions, two premier pavilions, 180 premier mega stalls, 10 premier gold stalls, 10 premier stalls and six standard stalls in separate zones at the fair. 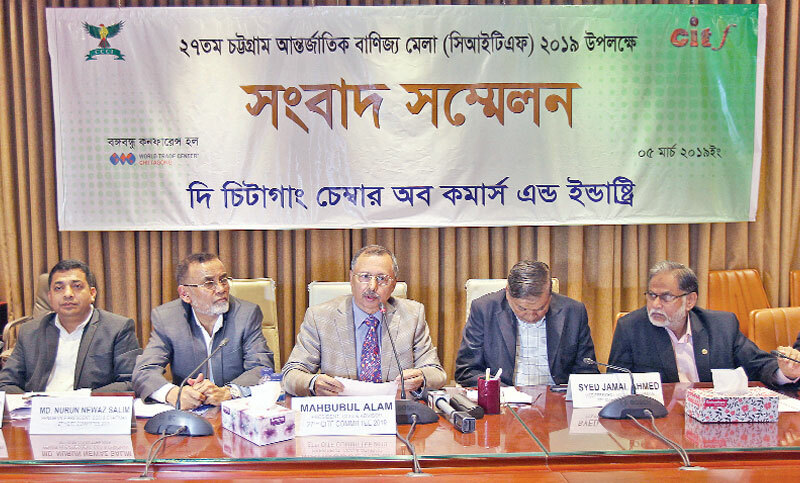 Like every year, there would have participants from India, Thailand and Iran while Korea will take part for the first time this year, said the CCCI Senior Vice President Md Nurun Newaz Salim, also the CITF committee chairman, at a press conference at the Bangabandhu Hall on Tuesday. Thailand that would be participating in the fair as partner-country for the 15th occasion, will display products on an area of 4,500 Sq-ft, said Salim. The fair will remain open from 10:00am to 10:00pm everyday and the ticket price was set at Tk 12 per person. The fair will also be featured with stalls allotted for Sandhani, Biswa Sahittya Kendra and ‘Right Action for Disability (RAD)’ among others as a part of social responsibility, he said. Sufficient security arrangement and fire safety measures have already been taken and other facilities developed for the visitors on the fair ground while a branch of Standard Bank will be there for safe transaction of money, said the CCCI leader. The e-ticketing and ticketing through short message service (sms) was introduced for the first time this year, he said. The fair committee Adviser and CCCI President Mahbubul Alam in his speech put up different aspects of the fair. Seeking cooperation from all, he also informed that a process for producing fibre from banana-leaf will be displayed in the fair. The fair committee Co-Chairmen and CCCI Vice President Syed Jamal Ahmed, Directors Ahid Siraj Chowdhury Swapan, Tarafdar Ruhul Amin, Kamal Mostafa Chowdhury, Anjan Sekhar Das and Syed Sagir Ahmed were present at the press conference among others.